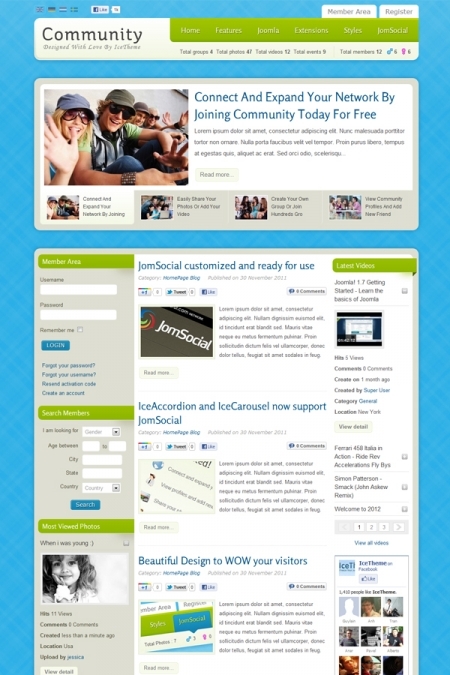 IceTheme Studio announced the first template to create a social networking site with a powerful component JomSocial. IT Community is designed with an attractive and colorful design that immediately enjoy your website visitors. In addition, there are 4 ready color variations that you can choose an option for the site and the availability of ready-made source files let you easily change any part of the design layout. To increase the functionality of the site and display in a contemporary manner JomSocial component developers to modify the most commonly used extensions and studio IceAccordion IceCarousel. Also, this pattern has been added a new module statistics display user activity JomSocial.